Perhaps you have heard the phrase, "speak truth to power." 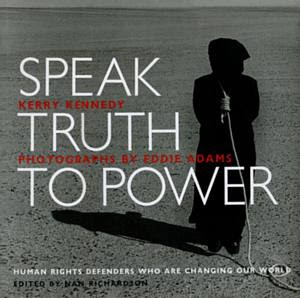 As indicated in one of the images, there is a picture book by that name, which includes testimonies from fifty human rights activists from around the world. 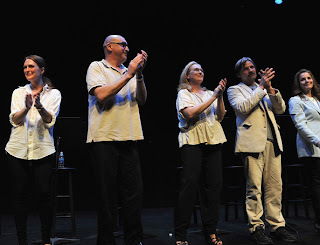 Ariel Dorfman has written a play, with the same title, based on the book. Hollywood stars have given readings under that title. 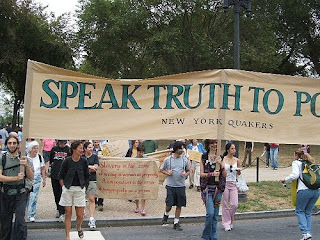 Public demonstrations frequently have banners in the parade: Speak Truth To Power. If you want to, you can wear a t-shirt that bears the message. Clicking on any of the images, if you do so from the original posting at www.gapatton.net, will get you to the source. The Urban Dictionary, which I sometimes consult, has a couple of references. One of them opines that the words constitute "a vacuous phrase used by some on the political Left." 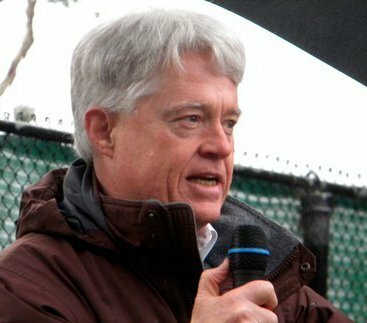 Another presents the idea that the phrase was "coined by the Quakers in the mid-1950s." The Quakers themselves attribute the phrase to a " Charge given to Eighteenth Century Friends." I believe that I first became aware of it from a book published by the American Friends Service Committee, currently out of print and unavailable. What most intrigues me about "speak truth to power" is the implication that the mere articulation of the truth, in a public space, will provide a real counterweight and alternative to the realities that have been created by, and support, the powers that rule the world. The phrase assumes that words can create new realities. And that is exactly what I think.